Driving from Bangalore to Hyderabad, I decided to venture into Penukonda town to see the fort. As I drove through one of the gateways, I realized a good part of the town lies within the fort walls. 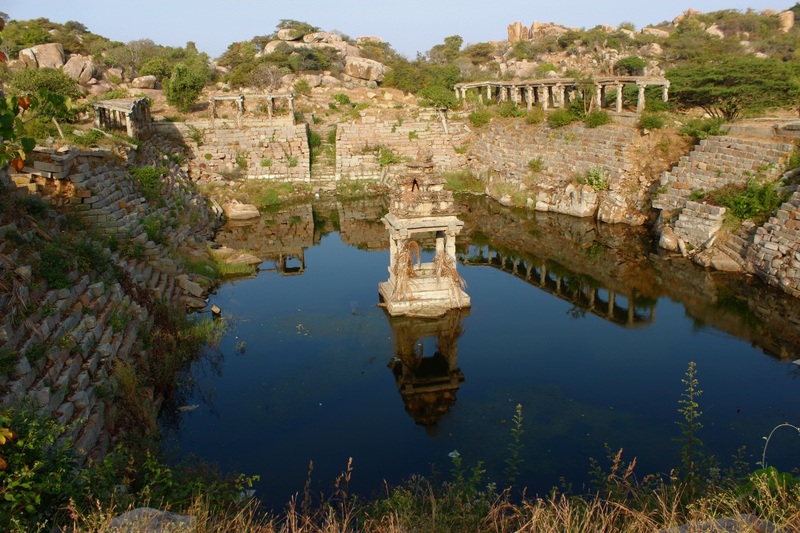 Having served as one of the capitals of Vijayanagara empire, Penukonda has its share of historical monuments.. fort walls & bastions, temples & wells, a palace, a jail, tombs, shelters for travellers.. 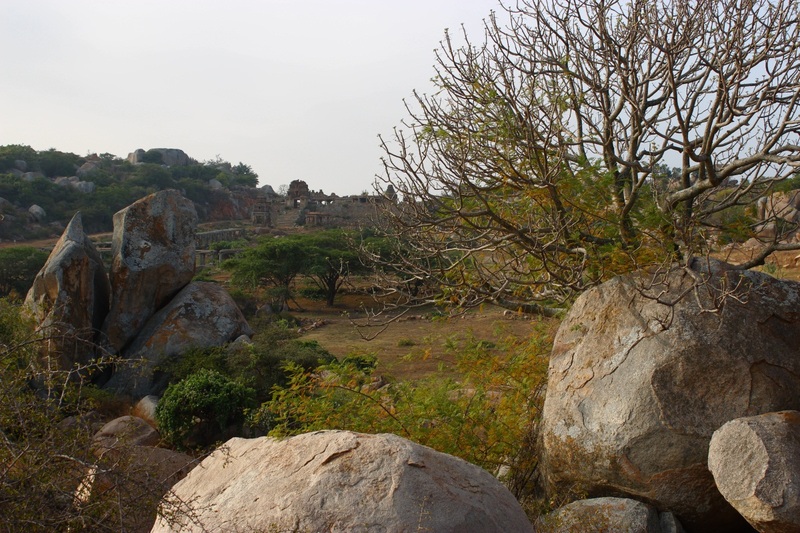 The fort walls are not just on plain land but also on hills. 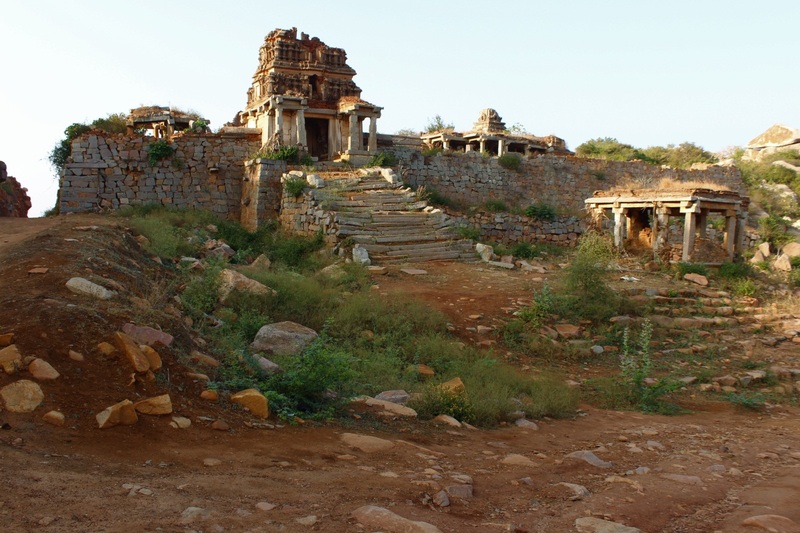 One of the town residents suggested me to visit Narasimhaswami temple on the hill and it has a motorable road right till the temple steps. 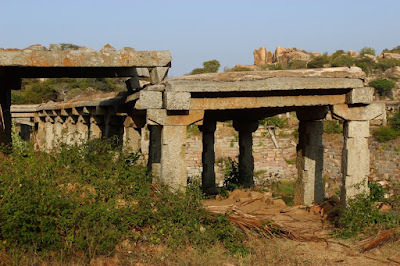 I thanked him and left, drove past Penukonda fire station towards the hills.. the road started climbing, curvy and deserted.. metalled road ended and dirt road started.. as I went higher, hairpin turns came frequently, ruins of forts walls came into view. At the highest point of the road was a gateway which opens up to a small plateau. 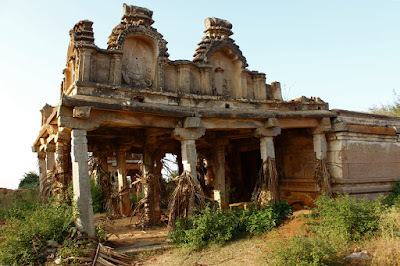 Close to the gateway is the temple complex occupying a large area has lot of structures... Gopura, Mantapas and a Kalyani (stepped well).. however, most structures are in bad shape, some in the verge of collapsing. 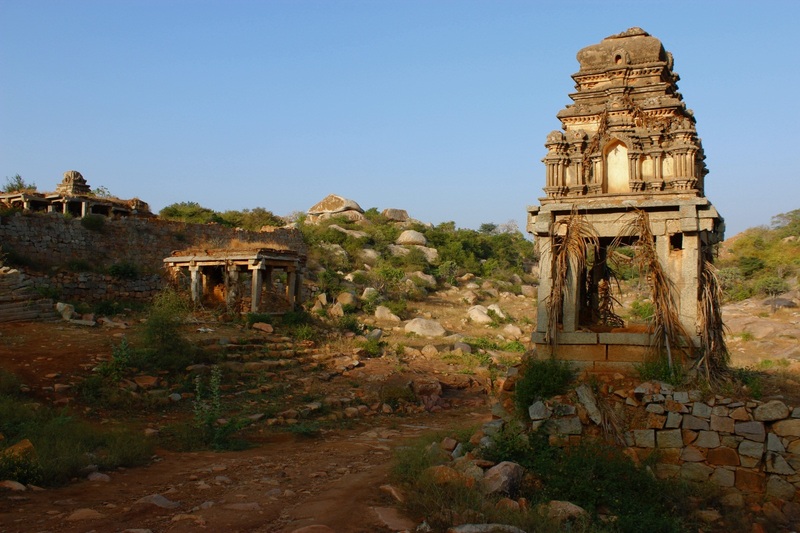 Unlike other creations of Vijayanagara which usually are in good condition, this particular monument's condition is terrible. The main temple is built on a high platform with a broad stairway leading to the Gopura. 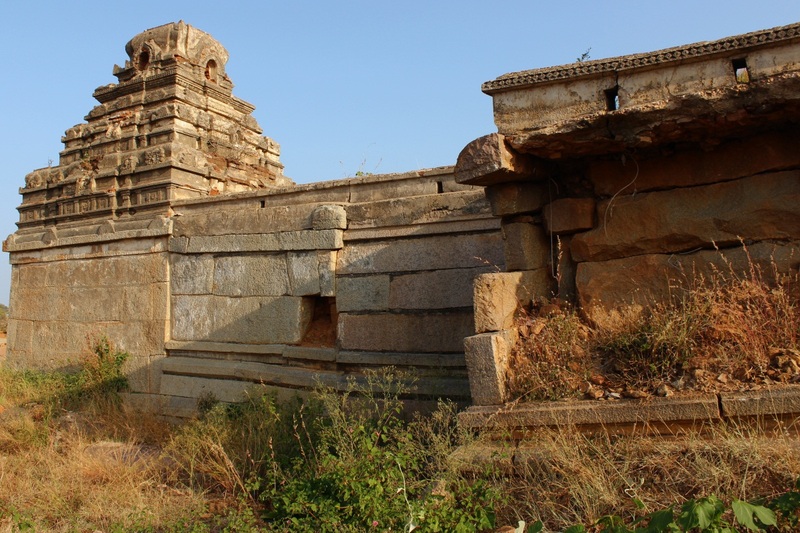 Definitely builder of this temple had a grand vision. 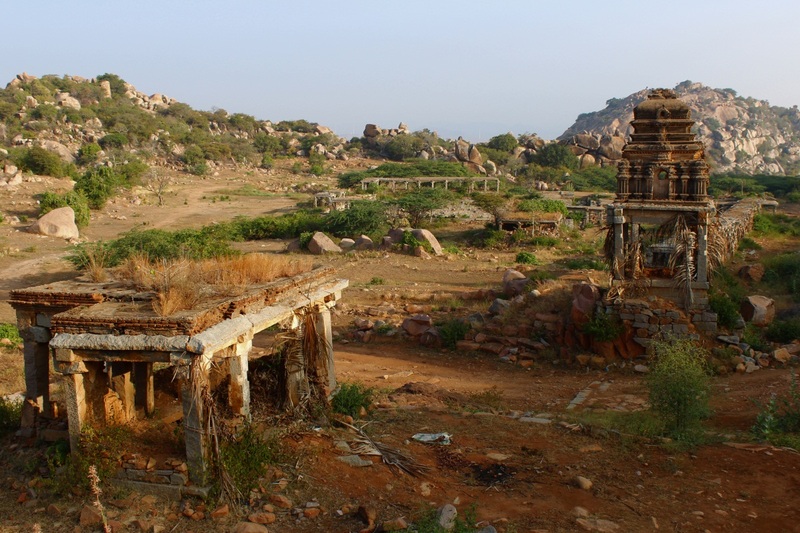 It seems the temple was built hurriedly... probably not a well funded project. 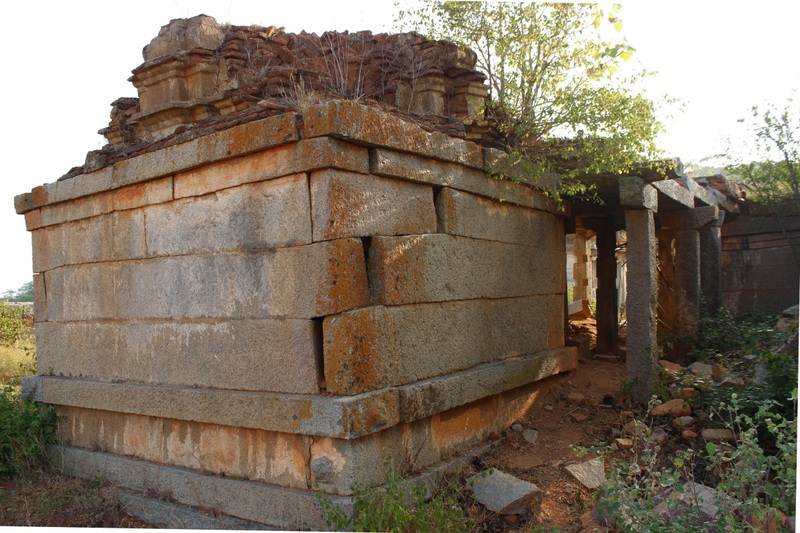 This is the Mantapa opposite the temple entrance. As you see even this structure is built on a platform. 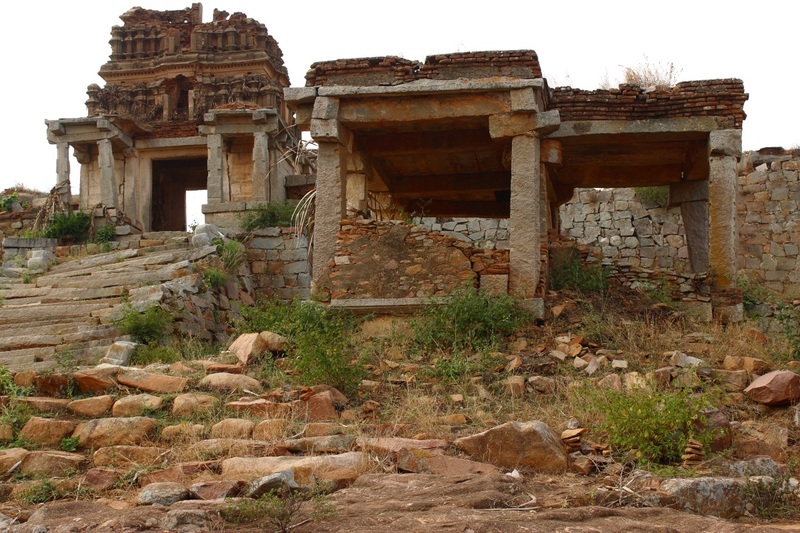 While the Mantapa's base and midsection are made of dressed granite blocks, the Shikhara is a brick and mortar job. The inside view of the temple gateway. Looks like the shikhara was vandalized by treasure hunters. A close look at the dressed stones; pillars and beams look rough cut - does this indicate a rushed job or a low cost project? One of the mantapas, probably used for open air rituals. The temple's mukha-mantapa. Coconut leaves tied to most pillars could be an indication of a fair here some days back... probably the annual fair. 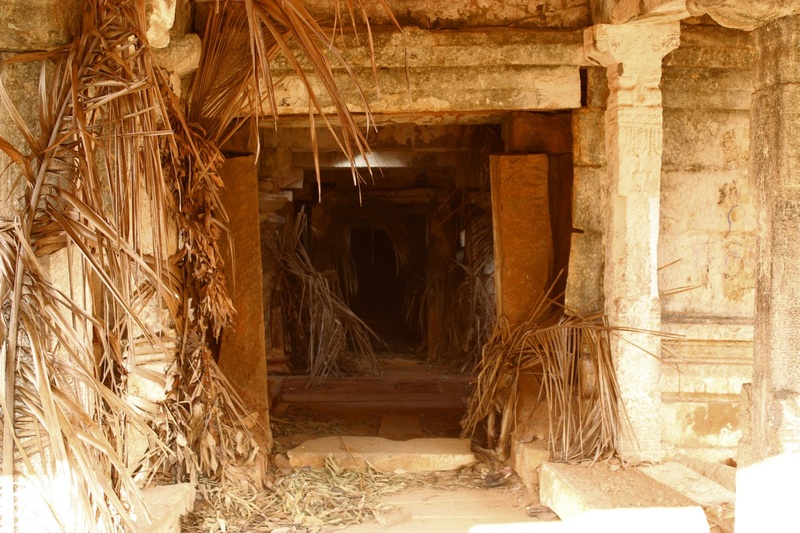 A glimpse of the temple interior. I did not venture inside. I went around the temple, the exterior is pretty plain. Every bit of the structure has been vandalized. Dressed blocks have either been disturbed or removed completely by treasure seekers :( The Garbhagudi Shikhara look good in this angle. To the rear of the temple. Blocks spanning the entire width of the structure have been used here. I think this is the original temple, the front portions are all extensions. I walk back to the temple gateway, standing under its fallen Gopura I look at the sight ahead. On the right side is another peak of this hill on which is a bastion. In the shallow valley between the two peaks is a stretch of rampart wall. 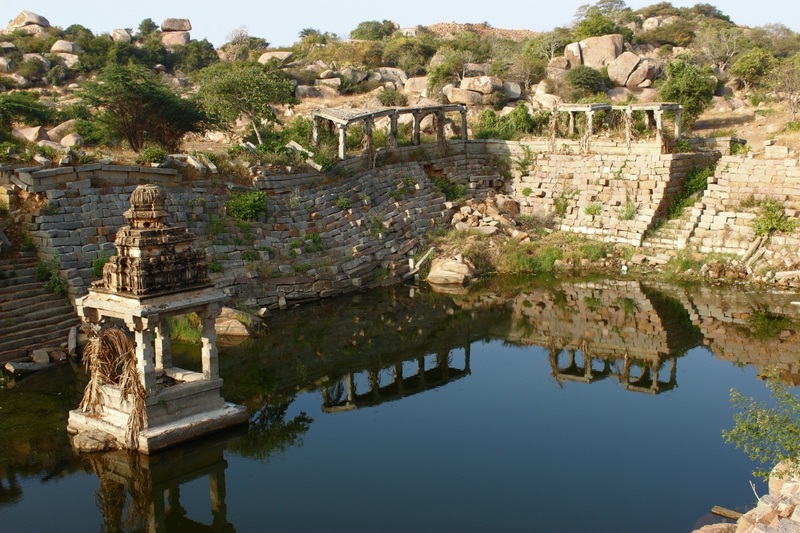 The temple complex was designed to accommodate hundreds of people, shelters were created where travellers could stay. 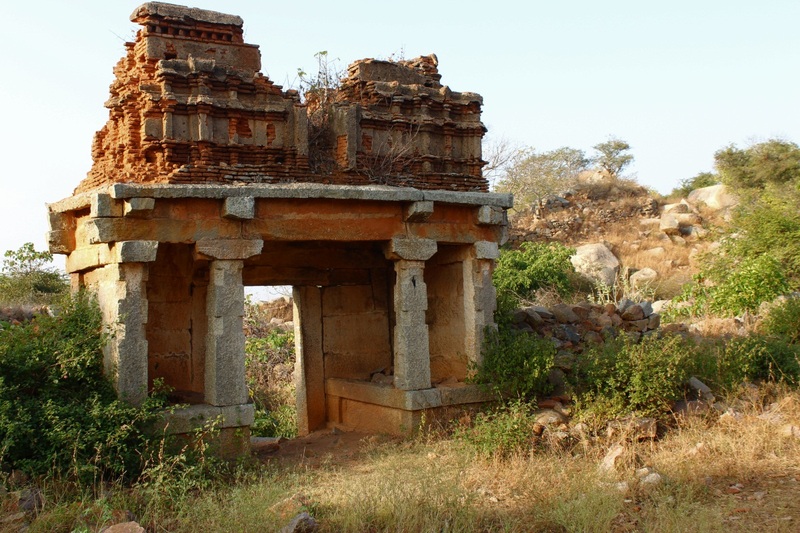 Thinking of facilities for travellers.. Krishnadevaraya was an ardent worshipper of Tirupathi Thimmappa. So would the kingdom'd subjects be. 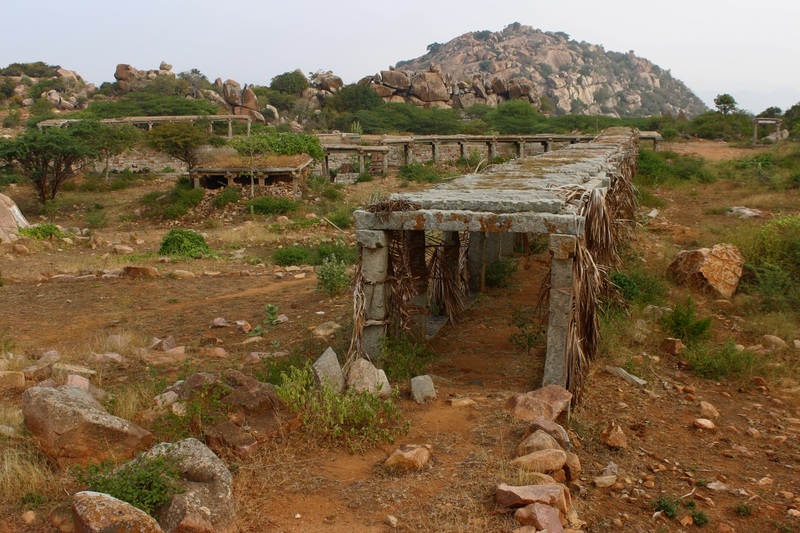 It seems lodging & boarding facilities were made available on all routes leading to Thirupati. 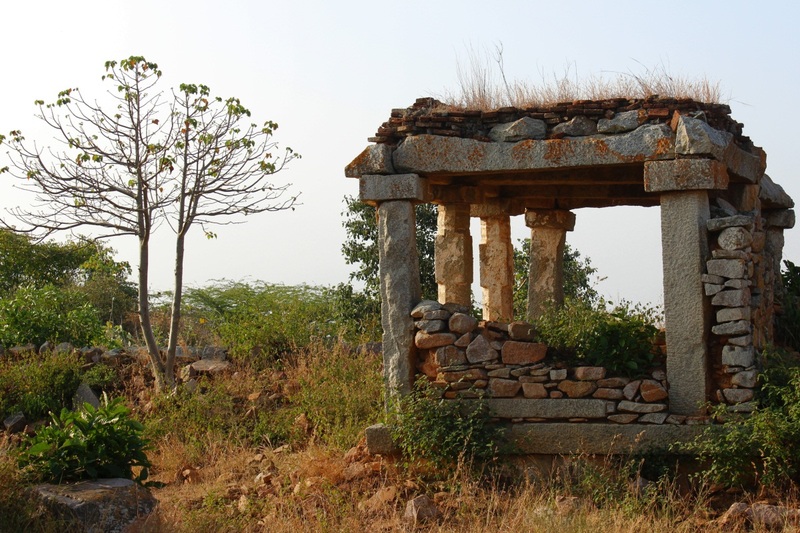 Shelters built about 500 years ago are still being used. I walked along the shelter but little away, right next to the wall of dirt, boulders and bushes. The place was silent, only sound I could hear was pebbles crunching with every foot fall. The silence was suddenly broken by noise in the bush next to me.. I turned towards the noise.. a large pig or a boar was startled by human presence took off deeper into the bushes, out of sight. I was shaken for a moment. I composed myself and walked towards the Kalyani. Water seems fresh and deep. Looks like originally the entire perimeter of this stepped well had shelter. For some reason some parts are missing now. Also some part of the steps has collapsed.. probably the foundation of the steps must have given away. A close look at the hill's peak, on it is a bastion, a good sentry point for the plains and the town below. On the left hand side of the picture you can see rampart walls. From here is a foot path on the hill slope leading straight down to Penukonda town on the plains below. View of the temple complex from the plateau end. Was there more time, I might have explored the peak and reached the rampart wall and bastion. I walk back towards the main temple and take a last look at the shelters and the peak in the background. I get into my car and drive down slowly, stopping on and off to check out the fort walls. About three-fourth way down, I stopped on a gentle slope, freshened up and had breakfast.. 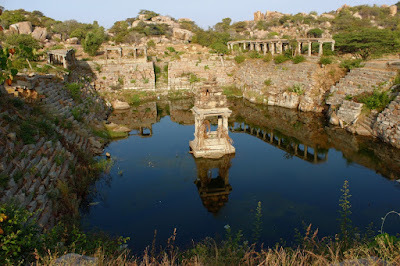 I still plans to go back into Penukonda town with hopes that Gagan Mahal gates were open.. I have missed this, and been wanting to go there for some years. I only saw the structures at the base, a huge gopuram and some old temples near the school. 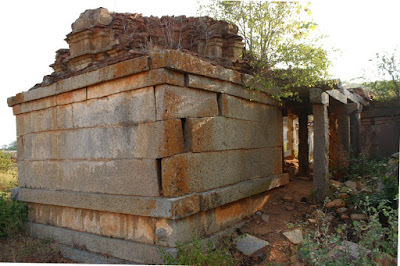 I had seen just one pic, but you confirm there are many more structures there including a kalyani with a mantapa. 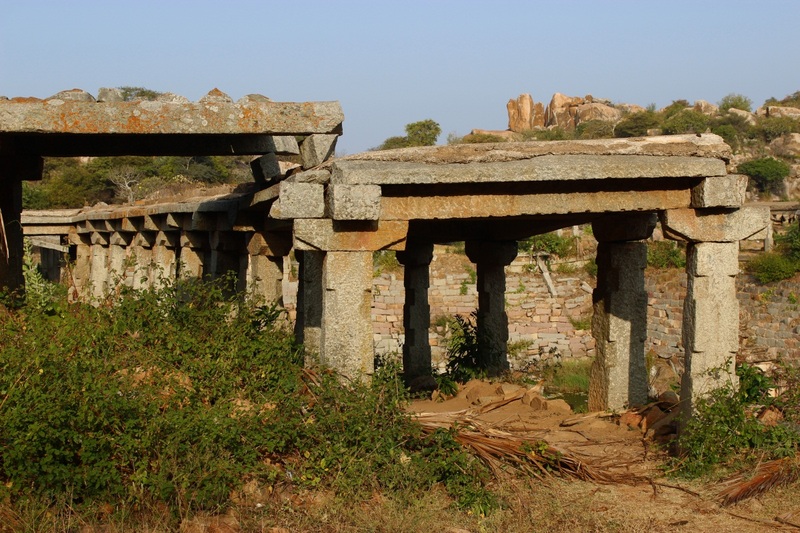 Siddeshwar, how safe is the place for a family to plan a picnic there? or it is better to get some local person along to feel safe and be of help? Your pictures use wonderful light! without clouds in the sky your pictures capture a wonderful mood. Yes, the day I visited it was a clear-sky-day but it had rained two or three days before. 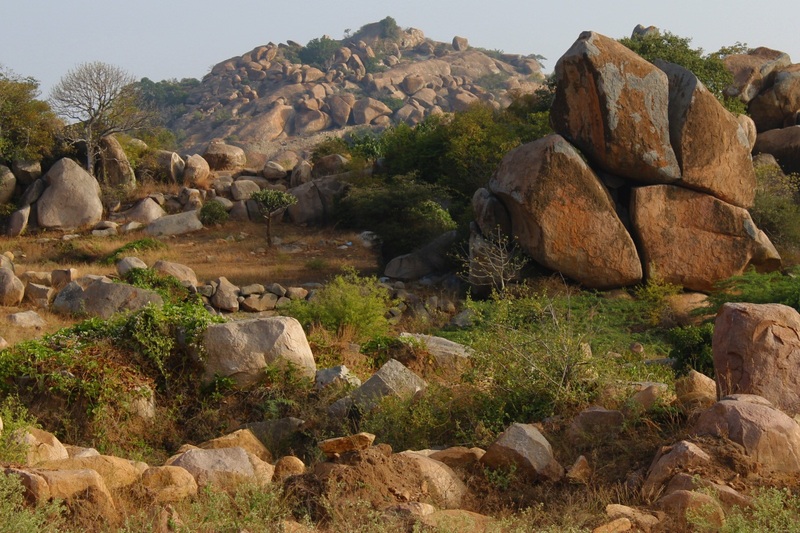 Penukonda hill is quite secluded except for cattle and their herds. I think the hill is safe even if you are visiting with a family but its good to be in a large group. The inner most fort which I missed is 1½ km from Narasimhaswami temple, it can be reached by foot only, its better someone remains back to guard your transportation. Alternatively, you can climb the hill by foot, the path starts at the base of the hill near Gagan Mahal.